For when I nerd it up. ABS brakes were the first step. The last will be us humans in observation cages next to the monkeys. 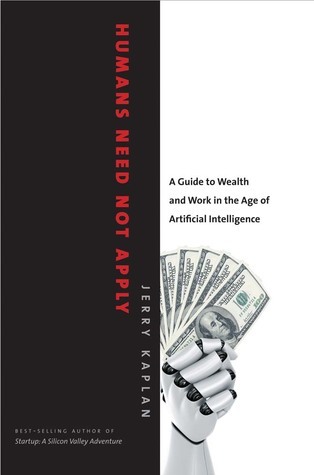 Jerry Kaplan is an expert in Artificial Intelligence and Computational Linguistics and attempts to guide the reader through what impacts AI and Robots will have on our future. In doing so, he raises many of the economic, ethical, and societal problems we are going to have to start addressing. I first became aware of this book via CGP Grey’s short documentary of the same name (see below). To say there is a storm coming is an understatement. Kaplan guides us through the technological aspects of this topic with knowledge and skill. Where this book falls down is in his blind adherence to free-market solutions – ironically whilst pointing out several examples of where the free-market has failed in the past. For example, some of his ideas about education are problematic. What he proposes with “job mortgages” is essentially traineeships and cadetships* that in my parents’ and grandparents’ generations were paid for by employers, with his modern twist being that employees should take out a job mortgage for. In other words, all of the cost and risk is moved from employers to employees. ** How can anyone suggest that sort of thing as though they aren’t talking about slavery or indentured servitude? *** Sci-fi has been imagining that sort of scenario for decades and they weren’t calling it a good idea. His comments about how rich people being in charge isn’t all bad, like back in ancient Eygpt… Because monarchies worked so well for everyone, who was a monarch. Another gem was the idea that the free market could be in charge of wealth redistribution… Because it does such a great job of that right now. Now, in fairness, his plan was actually pretty good, but there were built in assumptions he didn’t really question despite laying out the framework with his discussion of automation taking our jobs. Kaplan spent most of his book outlining what amounts to a post-scarcity world, a world where human “work” would essentially cease to exist, and thus cost, value and products become meaningless. How can you maintain our current economic system in that world? Don’t we need to be rethinking about what utopia we wish to design and the machines that will make that happen? The final chapter has some interesting questions and ideas about what role humans can play in a world that the robots run and own. Whilst the ideas aren’t new, since science fiction has been prodding that topic for the best part of 70 years, he has grounded them in reality. If there is one takeaway from this book, it is that we all need to start planning the future now. Overall, this was a fascinating book that is well worth reading. ** It could be argued that this has already happened and Kaplan is just taking it one step further. *** Again, a point he acknowledges with reference to AIs becoming free of ownership. Oppose the gravitational force with your phalanges if you value science. 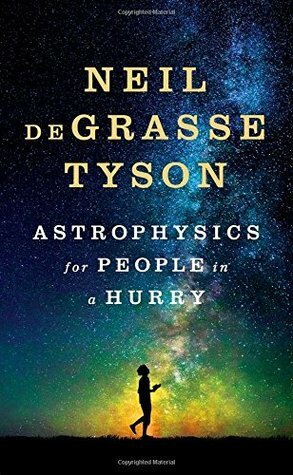 Science communicator Neil deGrasse Tyson understands that most people don’t have time to read physics books – plus they are hard work to read. So he decided to package together some of his essays into a book that covers the major aspects of astrophysics in a way anyone could enjoy and learn from. While reading this book I had a revelation. Could there be an explanation other than Dark Matter and Dark Energy for the gravity and expansion of the universe? I’m going to propose Pratchett’s Theorem as an alternate hypothesis for the expansion of the universe and gravity. Since the universe is flat and there are unexplained gravity and expansion, I postulate that this flat universe is riding on the backs of four large elephants. This explains the gravity pulling everything down. These elephants are riding on the back of a large turtle who swims through the multiverse. The elephants are slowly moving away from one another – which explains the expansion – and walking down the curved shell of the turtle such that each step is larger than the last – which explains the increased speed of expansion. This, of course, raises the questions of whether it was the elephants who were the prime movers behind the “Big Bang”, whether the elephants will keep walking down the shell until they fall off tearing the universe to shreds, or whether the elephants will eventually decide to walk back toward one another for a reunion? Do they also walk directly away from one another, or do they walk around the shell, such that the universe rotates? Given everything within the universe rotates, it would only make sense that this rotation is caused by the elephant’s motion. Anyway, NDGT’s book was a good read. It doesn’t dumb things down, nor use too many lay terms, which was refreshing. But as a scientist, albeit in a completely different field, it felt like the book was aimed at a more general audience, particularly those who aren’t familiar with many of the topics discussed. Which made it only a good but not a great read for me. 5. Becoming a Vampire Without Being Bitten: The Narrative Collective-Assimilation Hypothesis, Shira Gabriel and Ariana F. Young, 2011. A few years ago I saw a fantastic talk from Hans Rosling about the world and statistics. Okay, I probably lost a few people by implying statistics are fantastic, and now I’ll lose some more by saying statistics ARE fantastic. Unfortunately, Hans is no longer with us, but his son and daughter-in-law – Ola and Anna – are continuing his work with Gap Minder. Recently they released the results of their 2017 survey of world knowledge. After looking at the results they decided to call it the Misconception Study. * You’ll see why. That’s right, less than chance. People really don’t know that much about the world. Do you think you could do better? Well, find out! Take the 2018 quiz here. Of course, this is the part where I say that I passed the test. Humble-brag. But in fairness, as I’ve already mentioned, I’ve been following Gap Minder and I like statistics. *They probably called it that prior, but I’m making a point here, dammit!